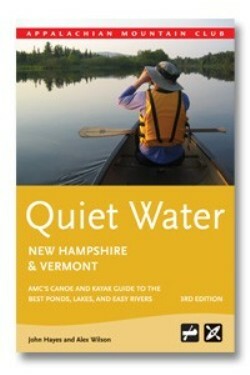 Quiet Water Canoe Guide - New Hampshire/Vermont, by Alex Wilson and John Hayes, 3rd Edition, 2010. The AMC Quiet Water Guides describe numerous lakes and ponds where canoeists of all experience levels can find great calm-water paddling. Each entry includes driving and put-in directions, descriptions of paddling routes, sketch maps, safety and equipment tips, and natural history essays on waterside flora and fauna. This newly revised edition of the NH/VT guide features 90 paddling destinations across the two states. 336 pp., 6” x 9”.